Can a photo shoot change someone’s life? For these dogs and their new families, the answer is yes! When I first stumbled upon these downright darling dog portraits on 500px, my heart immediately did somersaults. From the striking expressions right down to the expert styling of photographer Tammy Swarek, I was hooked right away. 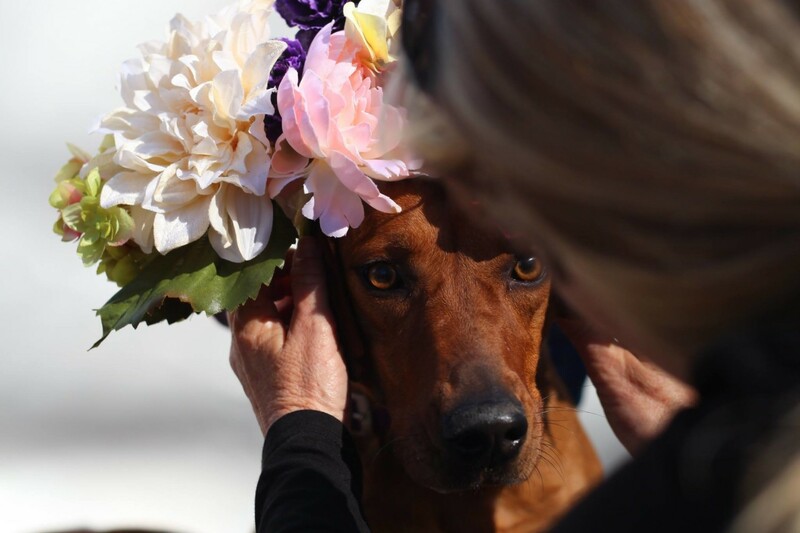 The Coachella-inspired flower crowns, trendy denim overalls, and dapper suits on these cute canine all threw me into a cute overload moment. But it wasn’t until I discovered that these were portraits of shelter dogs that I knew I had to share these photos with a wider audience. 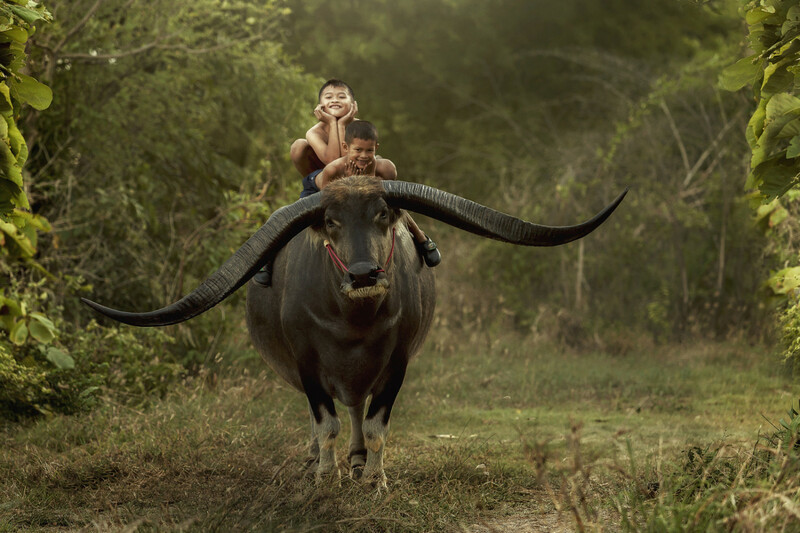 We at 500px are all about photographers who use their skills and creativity for a good cause! 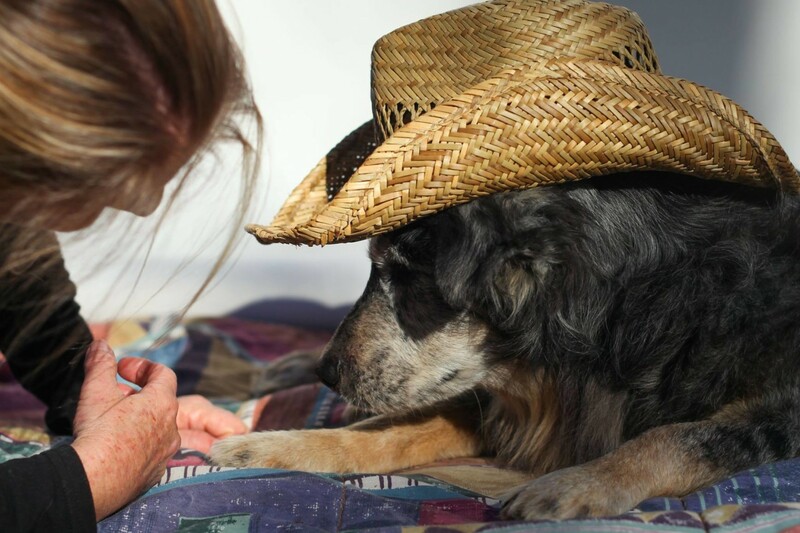 In this exclusive 500px ISO story, photographer Tammy Swarek shares the story behind some of the photos in her Shelter Pets project. 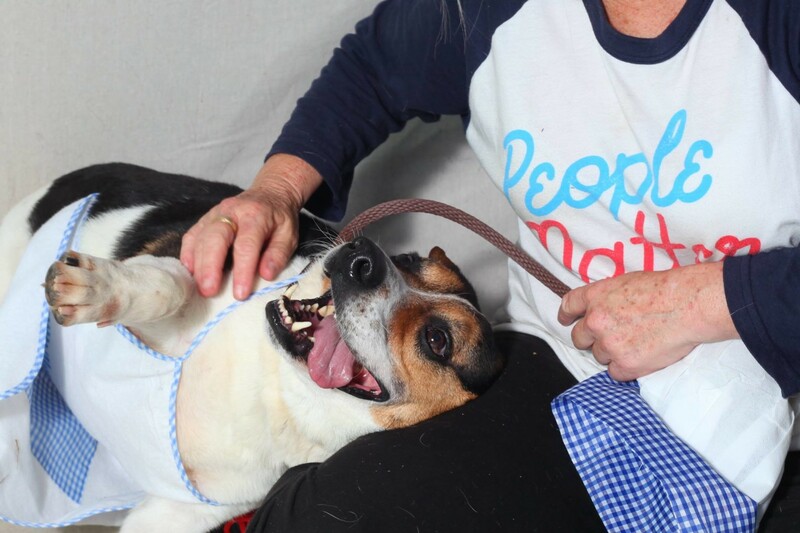 Thanks to her technique, passion, and initiative — 12 of these dogs from the Union County Animal Protection Society in Arkansas, USA have either been adopted, fostered, or have pending applications for adoptions. These stories may be at first heartbreaking, but most of these dogs have already found their happy ending in their new “fur”-ever homes. Scroll down, read on, and share this awe-inspiring story with your loved ones and friends! It’ll make your day. Find out more about Opal by contacting UCAPS! Find out more about Moses by contacting UCAPS! Find out more by contacting UCAPS! Available for adoption at UCAPS! Find out more info about this little princess by contacting UCAPS! Find out more info about Ms. Wesson by contacting UCAPS! Find out more about Casanova by contacting UCAPS! 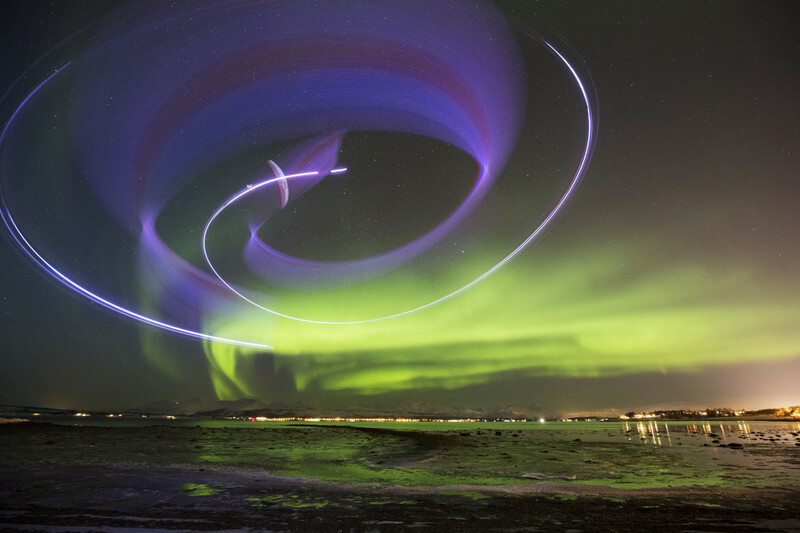 Want to learn more about the photographer who made this incredibly wonderful project happen? We sat down with Tammy Swarek for a chat. Scroll down to find out more about how she got involved, her creative process, and get some tips on capturing beautiful pet portraits! TAMMY SWAREK: In 2010, our lives seemed perfect. We lived on a beautiful ranch in Mississippi. It was the most peaceful place, and Matthew, my autistic son, thrived there. April 24th of that year a violent tornado ripped right through it leaving nothing but rubble behind. I was beyond devastated. It wasn’t just a home that we lost, it was our entire world. It was then that I started living behind the lens. It was easier to see what was happening around me through my camera. I struggled for months trying to cope with the new life we had, always broken hearted over the one that we left behind. I knew to be the mother Matthew needed, I had to find a way past it. That is when I had the idea to create the image, “Power”. I needed to make something beautiful and inspiring, something I could hold onto instead of dwelling on the loss. It was a very cathartic experience. After that, I committed myself to learning all I could about photography. How did you get involved with your Shelter Pets Project? I have a friend in California that shares a lot of posts made by the Sacramento SPCA. I was immediately drawn to the photography work they were doing, and how professional their animal photos looked. I looked at my local shelter’s page, Union County Animal Protection Society (UCAPS), and saw they were not working with a photographer, although they were doing a great job with their cell phone cameras. I contacted the shelter manager, Tanja Jackson, and asked her if I could help. She was agreeable that the images would spark interest in the animals. My best friend, Tammy Michael, is a fantastic floral designer and photography assistant. We made this commitment together. Our goal is to photograph every animal in the shelter, all 300. Do you have any tips on how to photograph portraits of pets? First, I practiced on my own dog to see if what I wanted to do was possible. Then my friend’s dogs. This was a whole new way to shoot for me. After getting the hang of shooting our furry friends, I set up a date with the shelter manager, Tanja. On that first shoot I brought white seamless and taped it alongside an exterior fence. While editing those photos, I knew I had to have a better plan. There were too many shadows that made masking out my background a nightmare. I have a simple white canopy tent and a canvas painter’s dropcloth that I have used for my fine art photography outdoor shoots. I love the setup because the tent acts as a giant softbox filtering the sun. For fill light, I pop my Speedlite in a Photoflex Octodome xs. We decided this was the way to go. Not only can you control the light, but it gives the animals an area to calm down in. An assistant that loves animals is critical! My assistant, Tammy Holmes, is wonderful. Together we bring the animals in, one at a time. We spent about 15 minutes just playing with them, using treats and a lot of silly talk, to get them to calm down. 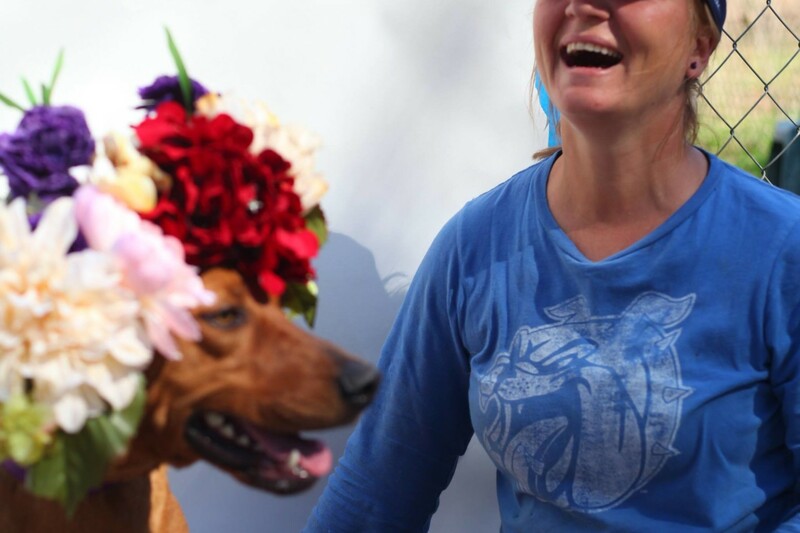 We bring our tubs of props, usually flowers and any clothing we can find, and decide what would fit that particular dog’s personality. 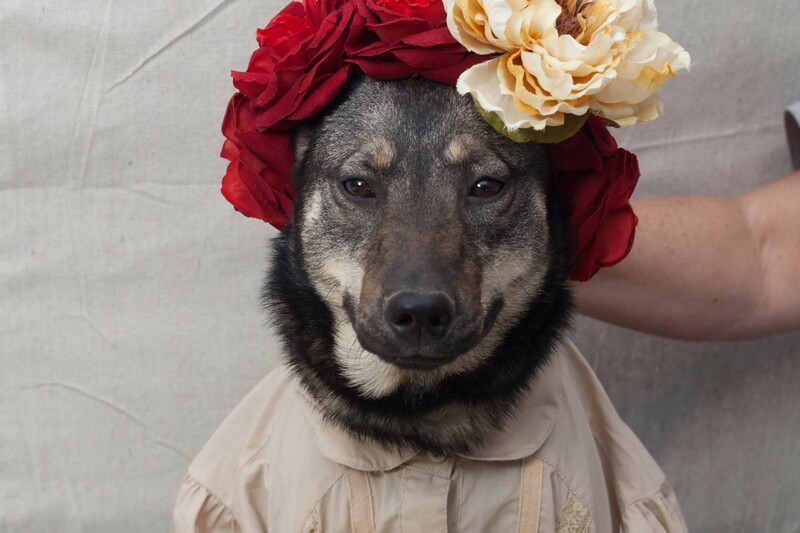 I am amazed at how well the pups do with dressing up. They honestly appreciate the attention. We get them styled the way we like and try to get them to sit by themselves for the shot. Sometimes this doesn’t work out and someone has to be right beside them. Planning for that makes editing a whole lot easier. We clip the beige canvas drop cloth to one side of the tent and use that as our backdrop. It’s great for cloning out assistants! Anything solid would work. A wall, anything. As for posing, I wanted to give them that “headshot” look. I wanted to humanize them as much as I could to get people to connect with the animal on a personal level. Composition choices were for aesthetics, as well as necessity. You can get human clothing to look really good from the chest up, but it is more difficult on the lower half of the pups. Sometimes sleeves are rolled up, or someone is actually holding the dog. I also wanted this to be part of my fine art photography which I typically edit in squares. How were you able to come up with creative ideas for these portraits? We try to look at them as any other human photo session. What would that dog look good in, and what do we have on hand. I have three sons that are grown. We have clothing of all sizes from over the years that I kept. I gathered together some basic white shirts, ties, jackets in various sizes, and a tub of flowers collected from previous photo shoots. 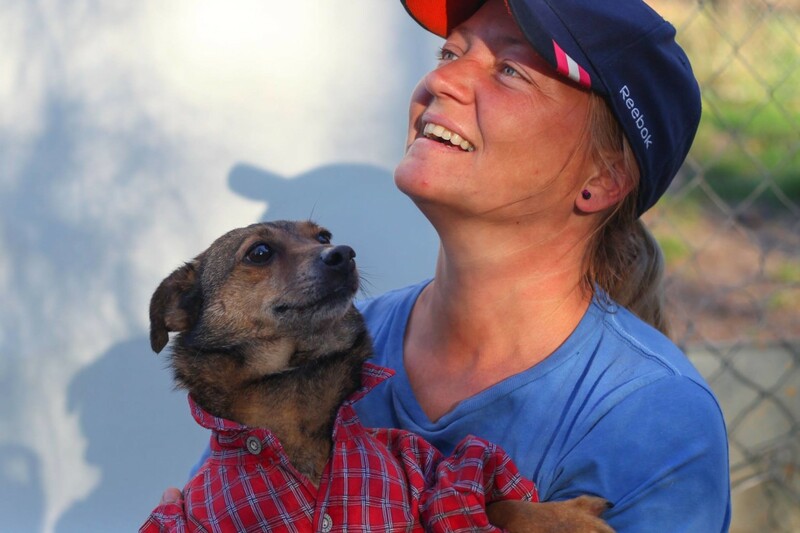 A couple days before our first appointment at the shelter, the manager, Tanja, posted a photo by Sophie Gamand. I messaged Tanja and we discussed that the floral crown genre was in my wheelhouse and would be an option for some of our female models. I love using floral crowns and am always looking for new ways to use them, most difficult being a horse, but it worked! One thing about shelter animals, they come in all sizes! You can find one that will fit into anything. Sometimes it is the outfit that makes us choose the pup for it. We glam them up and start the show! Any advice for how photographers who want to get involved with causes that are near and dear to their heart? Just reach out! I found it easier to message the shelter manager on Facebook at first. That also gave her the opportunity to view my page and see what type of work we did, and if she thought it was a fit. You will find they are eager for the help. 1. UCAPS is small and is home to over 300 animals. At times they are in a crisis for dog food and other supplies. You can find out how you can help by visiting their Facebook page. 2. Arkansas Paws in Prison is a fantastic program. They select sheltered animals and they go through complete obedience training by an inmate. I can testify to how well this works. I now have a Paws in Prison pup myself and he is truly amazing! To see more of her work, follow Tammy Swarek on 500px or visit her website. You can follow her project here or see more behind the scenes action of her interacting with the dogs here.